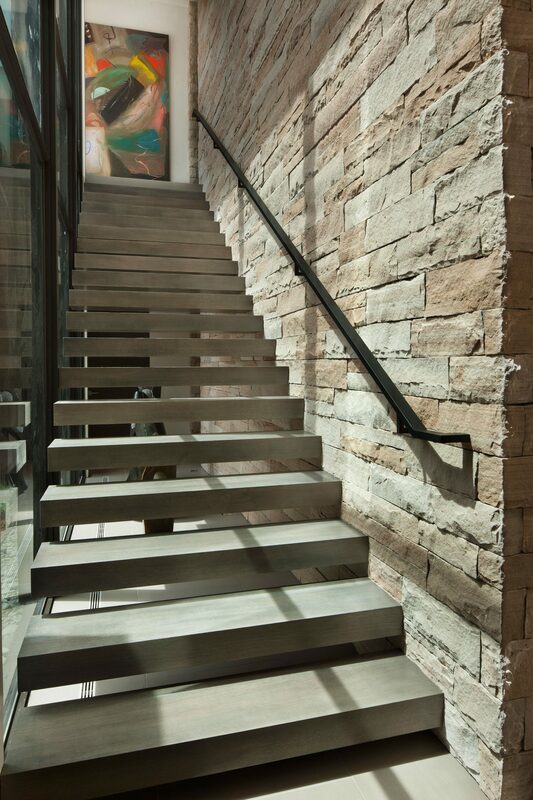 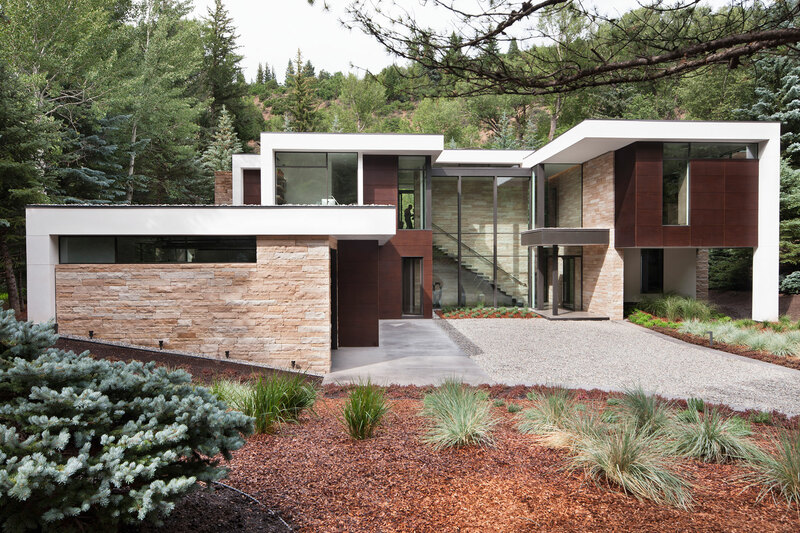 A sandstone wall parallels the Roaring Fork river, and seamlessly intersects the juxtaposing stone wall on opposite axis. 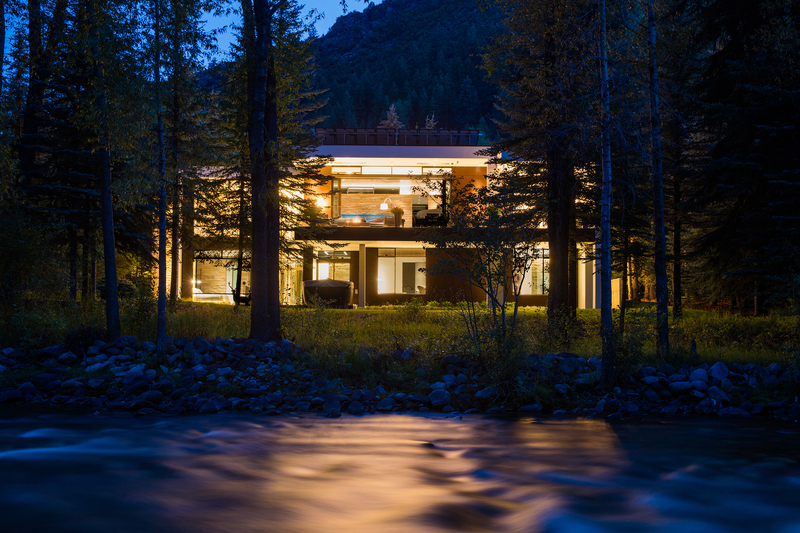 No maintenance materials, bold forms of glass, stone, Resysta panels, and stucco form the exterior; allowing the sights and sounds of the river to be experienced from every room. 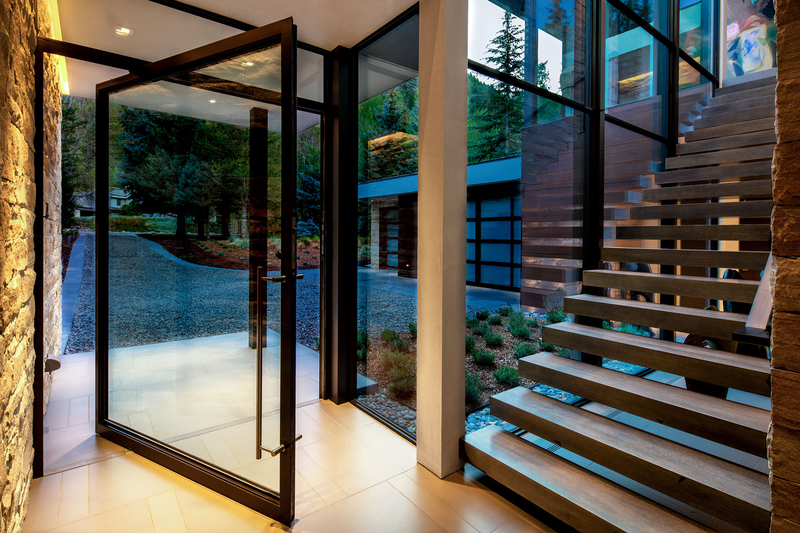 Carefully placed operable clerestory windows allow for passive ventilation and solar gain. 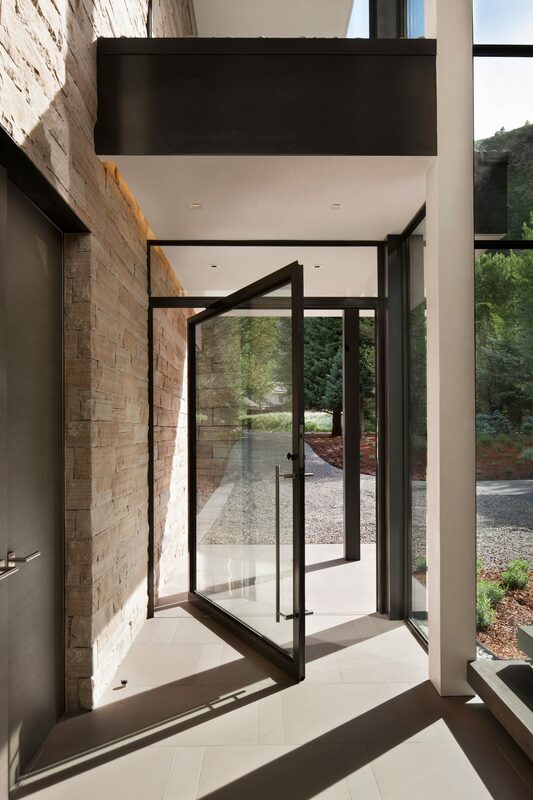 The glass pivot entry door opens to a floating staircase flanked by one of the two sandstone walls, and a floor to ceiling window-wall. 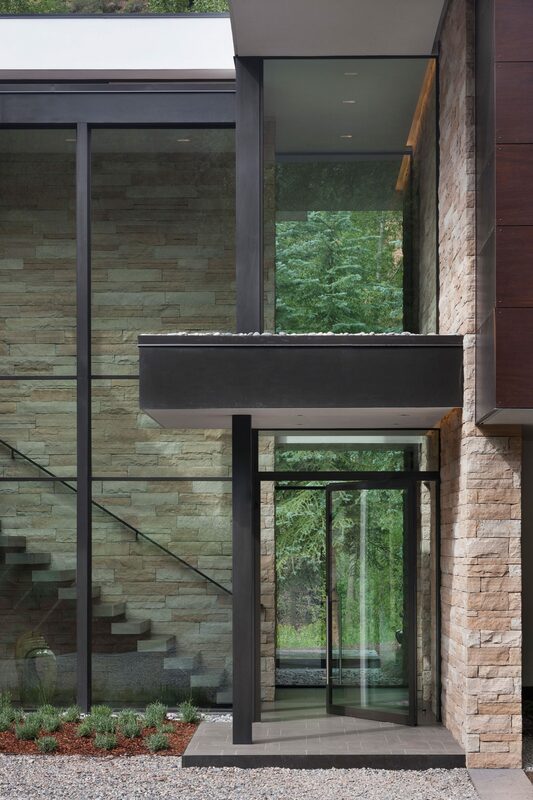 Stone intersects glass as it continues to the exterior. 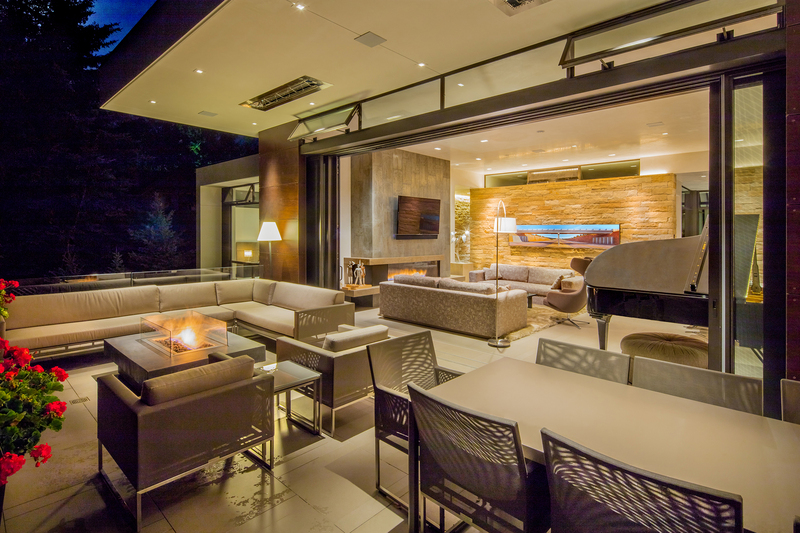 The living area opens completely via lift & slide doors to a 900 sf entertaining deck with glass railings. 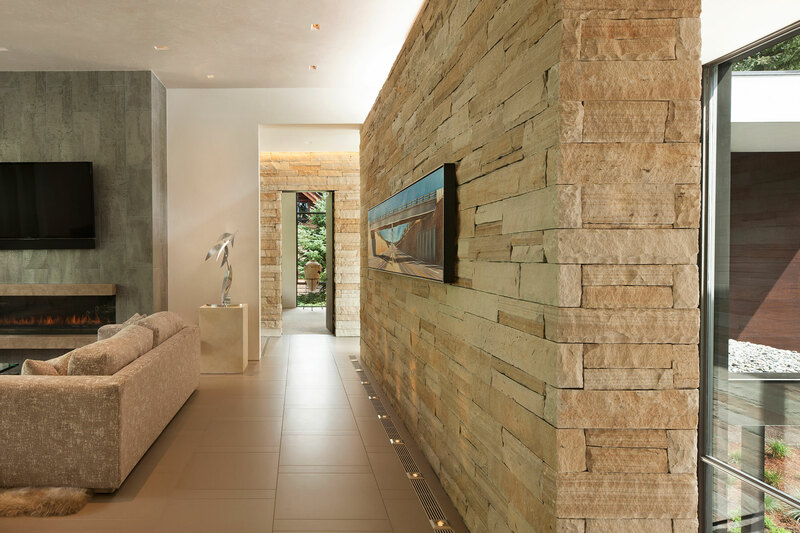 A six foot linear fireplace warms the space, while professional lighting harmoniously highlights the materials used throughout the design. 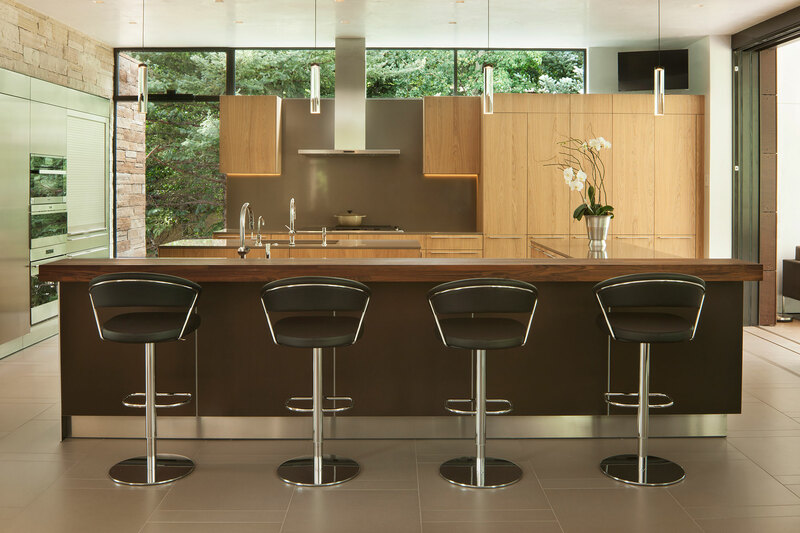 The custom Bulthaup kitchen includes a double island, generous storage, and a varied material palette, with a steel and wood-wrapped bar. 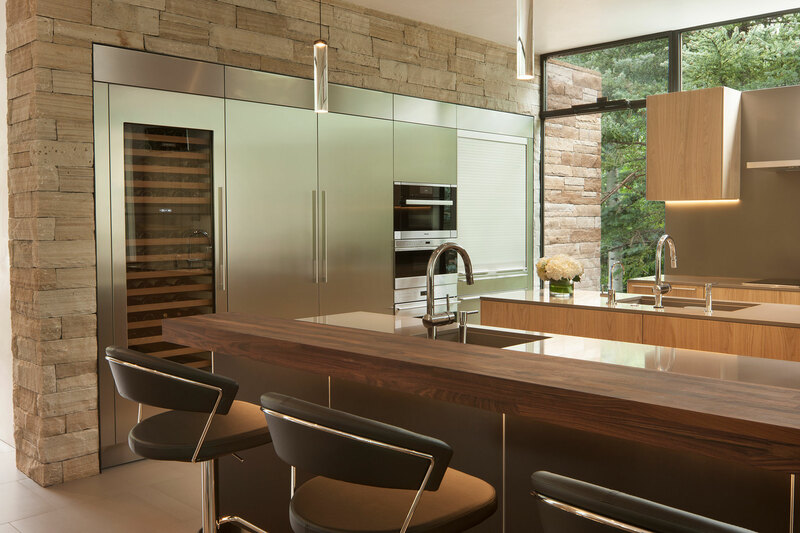 Within the kitchen’s sandstone wall, lies a stainless steel inlay housing a Sub-Zero fridge/freezer, wine fridge, and roll-top door beverage center. 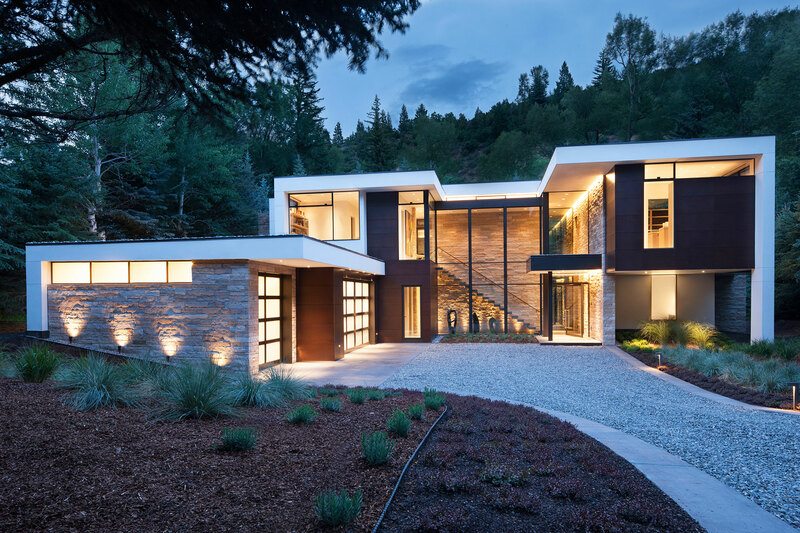 Clerestory windows allow sun, ventilation and views. 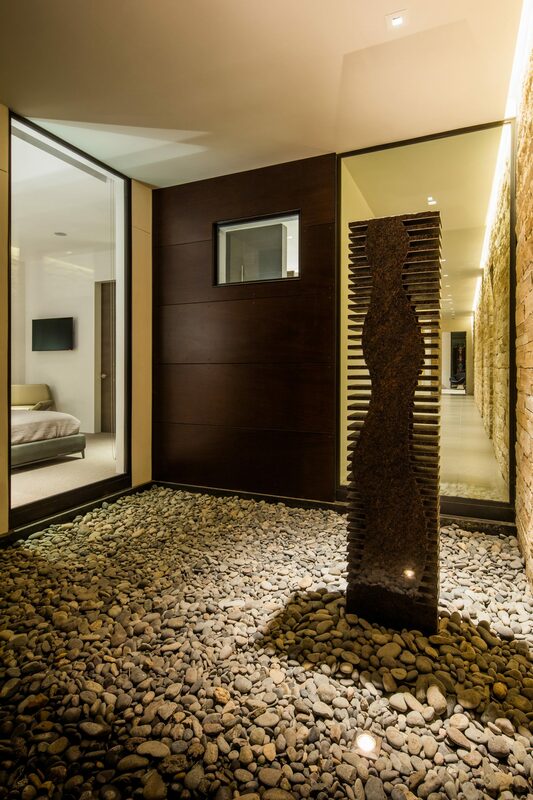 The master suite, with the stone wall extending through the glass, maintains the sleek palette with floor to ceiling windows and a linear fireplace. 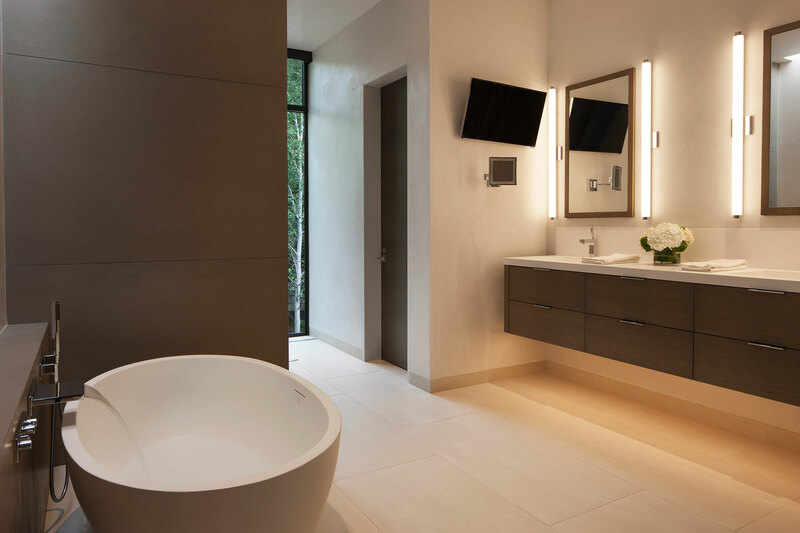 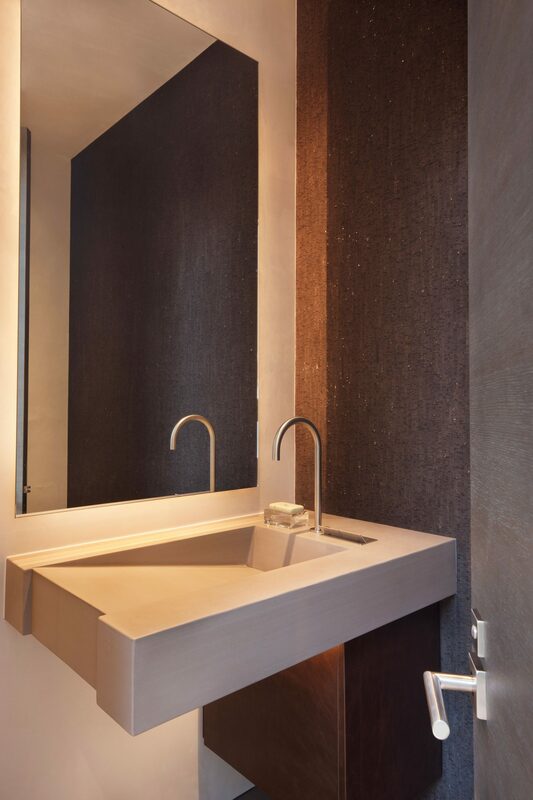 A floating tub with skylight above are the focal point in the master bath & adjacent wardrobe. 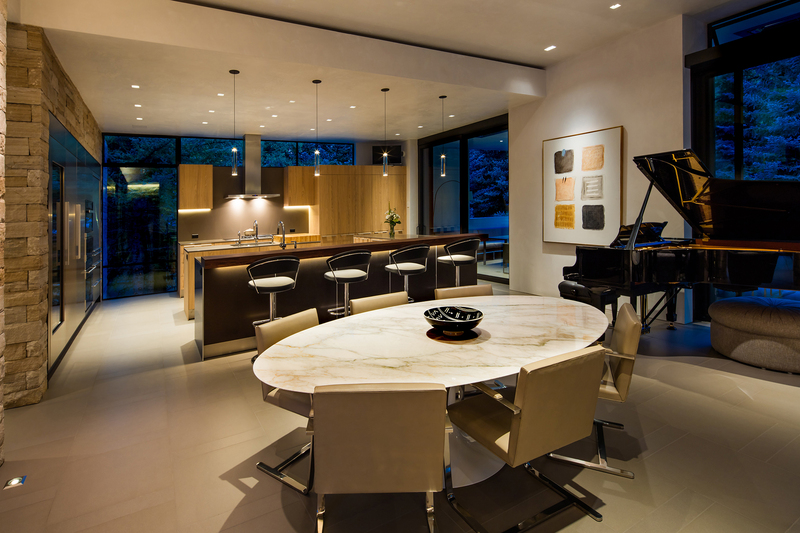 Also on the upper level are the Owners’ office, powder room and pantry. 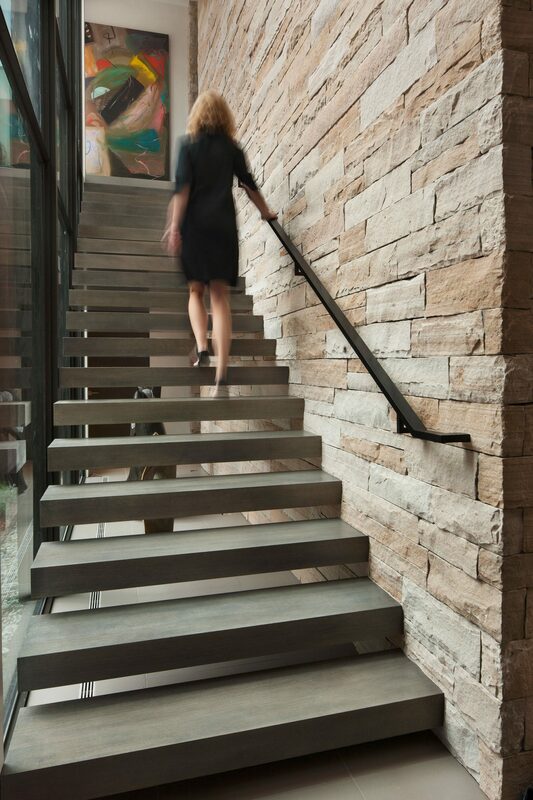 Off the entry, on the main level are three guest suites, a workout room with a walkout to the home’s hot tub, and art corridor leading to a sculpture wall.